How China and Southeast Asia are shaping up ahead of spring's biggest events. For more on the EU West, EU East, North American and South American teams of the Kiev Major, click here. As the snow melts in the north, Dota 2 fans’ eyes shift towards western Europe, anxious but excited for Valve’s upcoming Kiev Major—and more importantly for now, for the invites to the LAN that are yet to be sent. This tournament is one of two events sponsored by Valve in the time between the annual International. These Majors offer $1 million to the winning team and a guaranteed spot at the next event so long as the team’s lineup remains locked in. The Kiev Major is also, notably, the first official event in the CIS region, which is known for its large population of players and fans. The invite process for the Major isn’t always clear, but Valve's commitment to including as much talent per region as possible is. The number of direct invites, or teams guaranteed to appear at the LAN event itself, has remained pretty inconsistent - even for their top-level events. For those that aren’t directly invited but worthy of consideration, there are also regional qualifier invites, where invited teams from several regions fight for a spot at the event. Within those are also the open invites in which any team - yes, even you and your recent MOBA converts - may participate for a chance at a spot in the regional qualifiers. Open qualifier teams have certainly gotten far: Peruvian team Unknown.Xiu was present at 2015’s fall Frankfurt Major, and some teams, suffering from shuffle deadlines, have had to fight back to the top - specifically for TI6. Much will be settled after StarSeries Season 3 this upcoming weekend, where many of these teams will fight it out. In part one of this primer, we'll discuss about two of these regions: China and Southeast Asia. Each of these Eastern areas are hotspots for Dota 2 competition, with a large number of in-houses in the Chinese community and a fierce, dedicated circuit of Filipinos, Malaysians, Singaporeans, and more fighting across the isles. Much will be settled after StarSeries Season 3 this upcoming weekend, where many of these teams will fight it out. 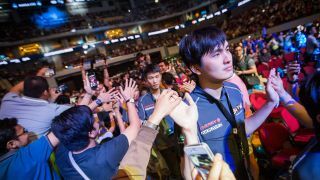 The Dota Asian Championships’ recently-finished qualifying rounds may be an indicator for who’s strong at the moment, as only four teams were actually invited, and the rest needed to fight in similar regional qualifiers. Valve is surely keeping their eyes on these results as open and regional qualifiers draw near. In this first part of two previews, we’ll peek at who in the East to look out for during the Kiev Major’s invite process. As always, the Chinese Dota 2 scene remains highly competitive. The most recent international showing was at ESL Genting, where Newbee took out TI6 champions Wings. The latter was also knocked out fairly early in the Boston Major, and so Valve may not be keen to give them a direct invite. Meanwhile, Newbee has been giving a strong showing in the scene, and so they may be under consideration. If not Newbee, then perhaps IG.Vitality will have a shot: the team qualified for SL and will show their chops this weekend. Also strong in the running at SL is the VG.J team, endorsed by honorary captain Jeremy Lin, which also qualified for DAC and is participating in Starladder this weekend. IG’s primary team may certainly be under consideration as well, as they won the second Chinese spot in the DAC. While their tournament results aren’t spectacular, their appearances are fairly consistent, and it would only be fair to hand an invite. Many other teams in the Chinese scene have faced roster swaps and mild performances, including Boston Major teams LGD.Fy and their main LGD squad, and haven’t shown up in international settings. Still, Valve likely has at least once source keeping their eye on the in-house and Chinese circuits, and so the slots will certainly be filled with a tightly-packed open qualifier round. A label of “underdog” isn’t quite fitting for teams of SEA, but they’re often treated as such. With a bad reputation from public game behavior and connectivity issues, much of the community underestimates the power of this region, despite regularly consistent performances in official and/or major international tournaments. For instance, Malaysian Warriors Gaming Unity took a 5th-8th place finish in Boston and have showed consistent top results in a number of tier 2 tournaments. However, their local rivals Faceless have been a constant presence in major tournaments, placing among the top international teams, especially impressive for their short existence. The two teams will likely be top contestants for a direct invite, and the other will certainly put up a fight in regionals. After two major fall shuffles, Execration, hailing from fan-packed Philippines, seems to be doing well after recently curing three out of their five TI squad members. Showing consistent strength, TNC most recently won WESG and qualified for the upcoming SL tournament, and so they’ll more likely than not fight for a Kiev spot too. Normally, at least one iteration of Korean org MVP is given an invite, considering the respect shown for the country’s esports history and the consistent showing of the org at Valve events. Execration had been a regional powerhouse and received a direct invite to Boston, though they were tragically unable to participate due to visa issues. However, they won’t be appearing in Starladder nor DAC, and thus they won’t be able to show their strength. There’s a good chance Valve will give them another chance through the regional qualifiers, given their stellar reputation and massive Filipino fan base. Also from the Philippines is esports organization Mineski, which has two squads, GG and X. Mineski.GG has had consistent top results in regional tournaments, and the latter has certainly been training. If Valve had to choose between the two, GG would certainly make the cut, though there may be room for both. Normally, at least one iteration of Korean org MVP is given an invite, considering the respect shown for the country’s esports history and the consistent showing of the org at Valve events. However, their more renown Dota 2 team, MVP.Phoenix, split after Boston, and MVP.Hot6 hasn’t been given a chance to shine yet. Depending on whether Valve has their eye on other regional teams, they may have to fight through open qualifiers, but there’s no doubt that there’s potential in this team, given the mix of experience present. If nothing else, these open qualifiers will certainly be entertaining. The region’s most famous team, Fnatic, has had some rocky times lately. After failing to qualify for Boston, which was captured in Valve’s True Sight documentary, captain Mushi left, as did many of their other members. It’s unknown if the org will pick up another group before at least the open qualifiers, but it leaves fans both local and international shaken for now. Fortunately for Valve and regional fans, SEA has no shortage of teams aiming for the win. In other words, even if any of the above teams don’t make it, there are squads such as Geek Fam, Clutch Gamers and HappyFeet with extremely limited experience but solid potential to keep an eye on. If nothing else, these open qualifiers will certainly be entertaining.